What is a feltmakers convergence? A Convergence is a gathering of felt makers, and the sharing of knowledge, experience and ideas is the underlying theme. 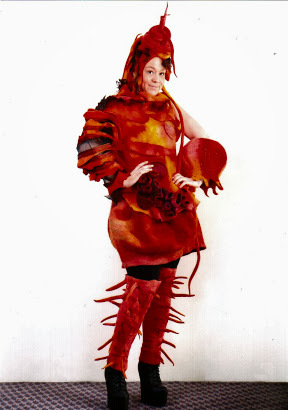 The Southern Hemisphere Feltmakers Convergence has been happening bi-annually since 1990. Each convergence is a little different, reflecting the fact that a feltmaking group in a different location hosts it entirely voluntarily. A convergence is an amazing event and some feltmakers have been attending them over many years ensuring lifelong friendships. The convergence program differs from year to year as it is traditionally largely made up of feltmakers who volunteer their time to share their knowledge, ideas and experience of feltmaking. A convergence attendee can expect many inspiring tutorials, workshops, opportunities to display your work, a fashion parade, installations, community group projects, lectures, professional development, informal demonstrations, a place to felt to your hearts content, traders trading their supplies, many networking opportunities, and much laughter and camaraderie with other feltmakers. It is a whole week immersed in the wonderful stuff of felt. Eat, sleep, and drink felt if you are that keen! It covers every aspect of felt making and is suitable for all levels of experience, wherever you are at with your own feltmaking journey. The 12th Convergence will be held in The Illawarra Region of NSW Australia, 1st-6th September 2013. It will be hosted by The Illawarra Feltmakers inc. Come along, learn, share, felt and have fun. I would LOVE to see the photo right side UP.. Thank you. Well that is taking "down-under" literally! hahaha! Hope you are all having super fun! 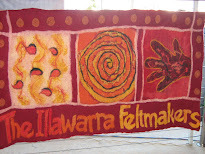 The Illawarra feltmakers are the first incorporated group of feltmakers in NSW established in 2010.. The Illawarra feltmakers bring together people with a passion for felt. Our goal is to foster the craft of feltmaking and feltmaking skills within our community.